Setting up Mac OS X on a PC carries its own inherent risks; despite the fact that Hackintoshes are generally very stable, there's always a chance that your computer will fail to start, for whatever reason. In these cases, your best option may be to temporarily boot Mac OS X with the help of a boot USB drive. 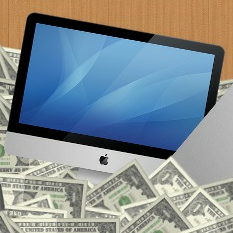 From there, you can fix whatever problem your Hackintosh is experiencing. Your Mac OS X installer USB drive can act as backup boot USB drive, but if you don't have yours anymore, you're not out of luck-- you can still create a makeshift boot USB drive on Windows instead. An empty USB drive - This USB drive can be any size; it doesn't really matter, since the Hackintosh bootloader will only take up a few megabytes. We'll be erasing this drive, so make sure you back up any files that you have on it. 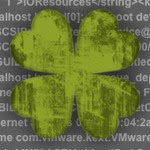 Chameleon boot sector files - A collection of command-line tools that you'll need to create a boot USB drive in Windows. "boot" file - The main boot file that Chameleon bootloader will need to start Mac OS X. This file was extracted from the newest version of Chameleon bootloader (as of July 1st, 2013), and can boot any version of Mac OS X, including OS X 10.9 Mavericks. "Extra" folder - A collection of additional kexts and configuration files necessary to get Chameleon bootloader working properly with Mac OS X. 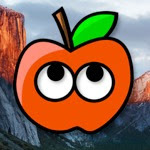 This folder should allow most standard Hackintosh setups to boot properly, though you can add your own specific kext files if you wish. This step is technically optional, but doing it reduces your chances of errors. Start Windows and plug your USB drive into your computer. 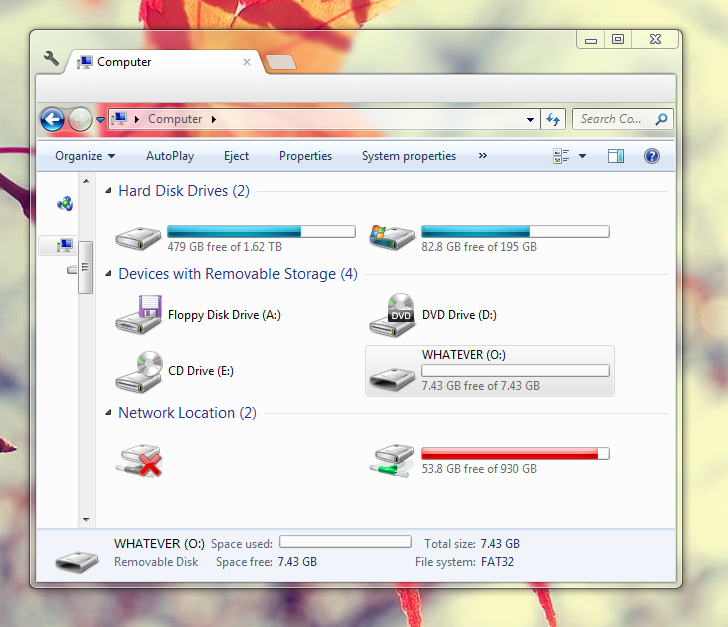 Open Windows Explorer (a.k.a. "My Computer"), and check the letter of your USB drive. Remember this for later-- in the screenshot below, my USB drive (named "Whatever") has the letter "O". Next, type "partition" into the Start Menu. Click on the first result, which should open Window's built-in "Disk Management" program. From here, find the letter of your USB drive, right-click on it, and click "Format" to erase it. When asked, format the USB drive with the "FAT32" file system. This should only take a few seconds. The Chameleon boot sector files will be stored inside a single ZIP file. Double-click on the ZIP file to open it. Click the "Extract all files" button in Windows Explorer, extract all of the files onto the Windows desktop (or some other random place where you can find the files later). 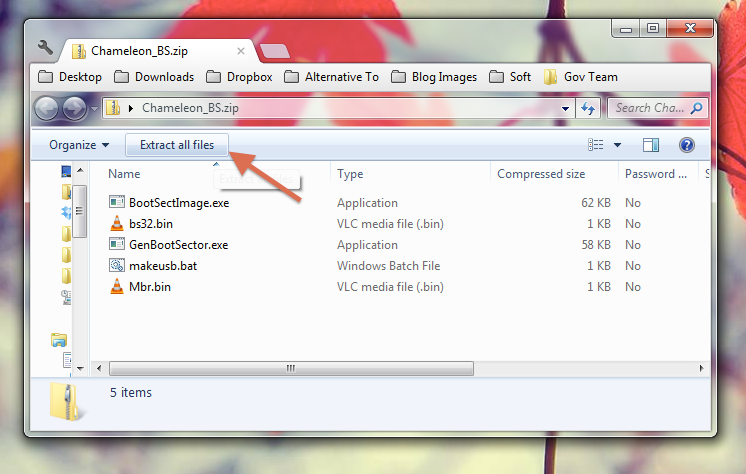 The files should be extracted in a folder called "Chameleon_BS". 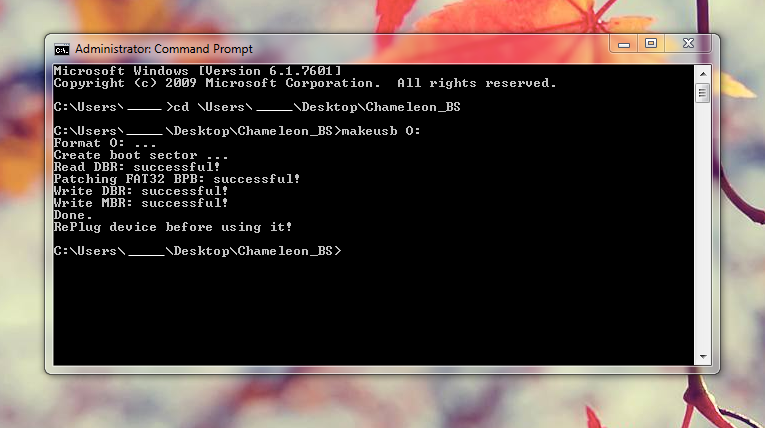 Next, type "Command Prompt" into the Start Menu. Right click on the first result, and click "Run as administrator"-- doing this should open the Windows Command Prompt. Don't forget to include the space between cd and \Users\. Replace "Letter" with the actual letter of your USB drive (don't include the quotation marks). In the screenshot below, the letter of my USB drive is "O". This command sets up the USB drive so that it'll be ready to boot Mac OS X. Once the Command Prompt finishes working (it'll probably only take a few seconds), eject your USB drive from your computer. 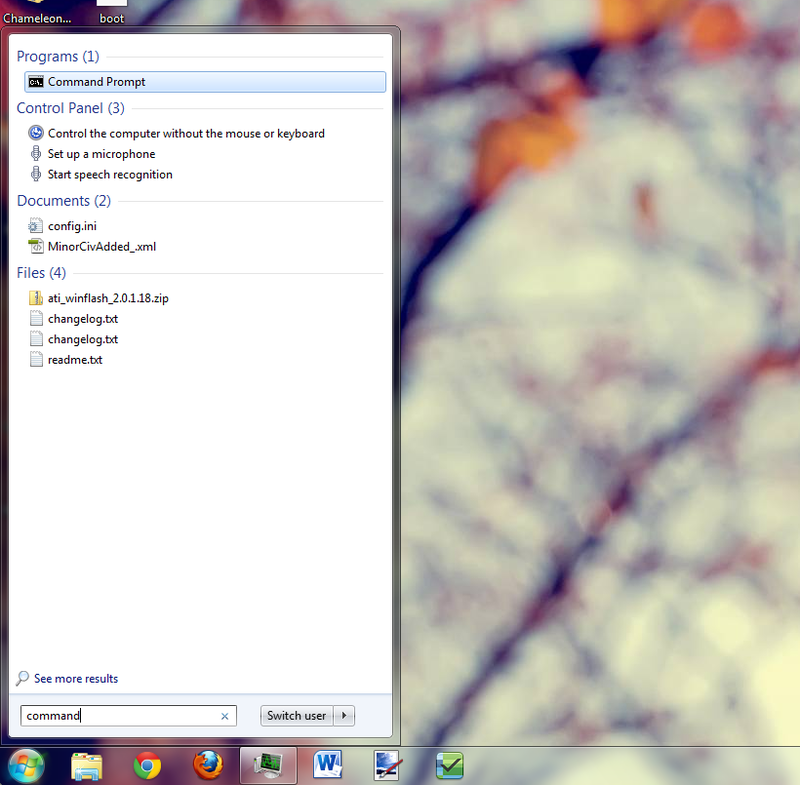 Then, plug the USB drive in again; this is necessary to get Windows to recognize your newly set-up USB drive properly. Finally, you'll need to copy several extra boot files onto the USB drive. Download the "boot" file and "Extra" folder; these are necessary files for the Mac OS X startup process. The "Extra" folder will be stored inside a ZIP file. Double-click on the ZIP file to open it. 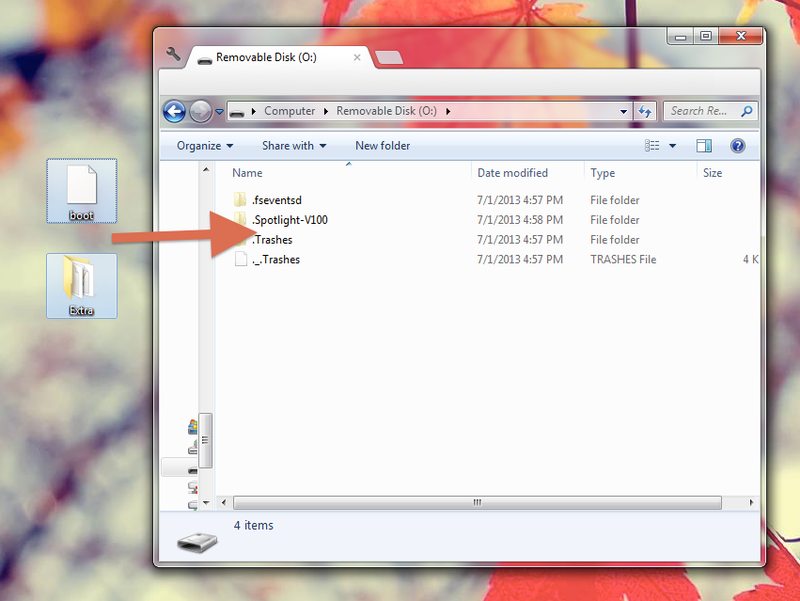 Copy the "Extra" folder into your USB drive. Next, download and copy the "boot" file onto your USB drive as well. This completes the setup process. Now you should have a working Chameleon boot USB drive that can help start Mac OS X on most PCs. Congratulations! NOTE: When attempting to boot Mac OS X with the help of a boot USB drive, make sure that USB drives are set to first priority in your computer's BIOS (Step 4 of our standard Mountain Lion installation guide).